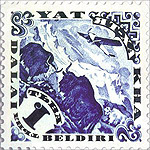 CD reviews: "Where Young Grass Grows," "Back Tuva Future" and "Dalai Beldiri"
These reviews first appeared in the March 13, 1999 edition of the American Reporter. Tuvan music has gained a permanent foothold in this country, in a way that other foreign musics that were briefly popular in the '90s didn't  the Bulgarian women's choirs or The Benedictine Monks of Santo Domingo de Silos ("Chant"), for instance, which came, conquered and then disappeared. But little Tuva  a North Dakota-sized nation tucked in the steppes between Siberia and Mongolia  seems here to stay. Like the above musics, Tuvan throat-singing seems mysterious and exotic to suburban American ears. But the novelty on anything new wears off after awhile, so how to explain the continued release of new Tuvan material stateside, the ongoing tours by Tuvan musicians? Well, Tuvan is a complex music. Like our jazz, blues or bluegrass, Tuvan music is not easily dissected. It features unscripted improvisation. It can be bent, molded and rearranged without ever losings its essence. It is not something, in other words, that will soon bore the listener. Huun-Huur-Tu was the breakthrough Tuvan band in the United States. Like the original "Chant," Huun-Huur-Tu took the country by storm at the beginning of the decade (1993, to be exact, with "Sixty Horses in My Herd"). And while "Chant II" did okay as a follow-up for the monks, Huun-Huur-Tu has shown real staying power  this is their fifth CD to be released in the states. Like many if not most Tuvan bands recording for a Western audience, Huun-Huur-Tu includes certain nods to the globe's dominant culture on their latest release. There is a Gaelic bagpipe. A tabla drum (from India, but still hardly Tuvan). One song co-written by a Westerner. But these are small concessions  and, given the strength and flexibility of the Tuvan style, kind of interesting. Like jazz or Argentinean tango, Tuvan music is great enough to embrace other styles. So a Celtic-Tuvan combo on "Highland Tune" is, if not riveting, at least intriguing. The four vocalists of Huun-Huur-Tu do it as well as anyone. Kongar-Ool Ondar  who has taken the shorter professional stage name of Ondar  is another leading Tuvan musician, albeit not as well known in the States as Huun-Huur-Tu. But he does appear on nearly all compilations of Tuvan music and won several national competitions. And he has a new album out on Warner Bros. that should help out with the name-recognition issue. Ondar's new album goes even further than Huun-Huur-Tu in exploring possible common ground with the West. There is a duet with Willie Nelson. Some nice fiddle playing from bluegrass star Sam Bush. A banjo. Dubbed chants from the late physicist Richard Feynman, who helped publicize Tuvan culture during the Cold War. Keyboards and synthesizers. In fact, outside of Ondar's own singing, there is little Tuvan instrumentation here. But most of the songs are taken from traditional Tuvan folk songs. And the modest, stripped-down arrangements work well at providing a backdrop for Ondar's magnificent voice, whether throat-singing or singing in a more typical, familiar style. Perhaps the attempts to meld Ondar's Tuvan heritage with more accessible forms would have worked better if the producers had included at least a couple tracks of straight Tuvan music without the other distractions. Ondar remains a singular talent, though, and nothing can hide the purity of his singing on the new album. 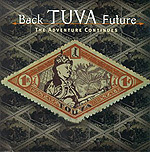 An upcoming release (April) from Yat-Kha shows a more modern face of Tuva. A folk-rock combo founded by former Huun-Huur-Tu member Albert Kuvezin, Yat-Kha opens their new album with a traditional Tuvan folk song, presented in traditional fashion. Then they begin breaking out in new directions. And quite frankly, Tuvan music works well with an uptempo rock and roll beat behind it. Kind of an Allman Brothers, Southern-rock groove with the traditional Tuvan stringed instruments and melodic themes laid atop. The band advertizes itself as Tuvan punk, but it's far more melodic than most Western punk. Still, there is a more aggressive approach to the music here than on the two above albums, a greater willingness to meet the world head-on.